Amethyst, Peridot and Freshwater Pearl Pendant set in Sterling Silver with 22kt Gold Vermeil Granulation. Features a Pearlescent Satin Finish. Chain Included. Free Gift Wrap. Michou Infinity Collection Pendant featuring Amethyst, Peridot and Freshwater Pearl set in Sterling Silver with 22kt Gold Vermeil. Chain included. Free Gift Wrap. 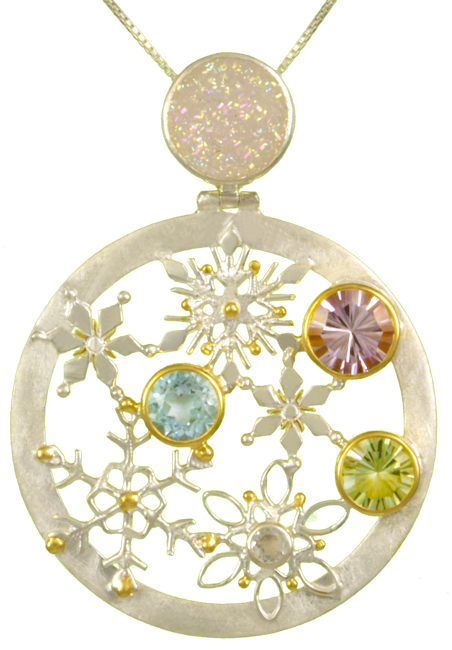 Michou’s craftsmen apply the ancient art of Granulation in the creation of this pendant. Small grains of silver are fused to a solid plate of silver. They are attached only at the point of contact. 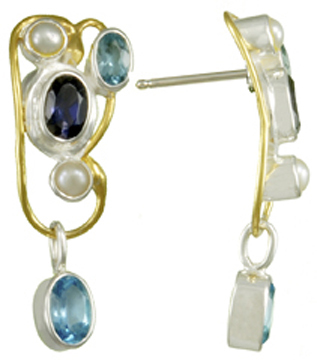 This is a technique that dates back to the Etruscans and has been perfected in traditional Balinese jewelry. Silver wire is cut into small bits and then a torch applied so that the bits become spheres. The spheres are then sorted by size through a sifter. Once the granules are sorted they are applied to the piece being made. 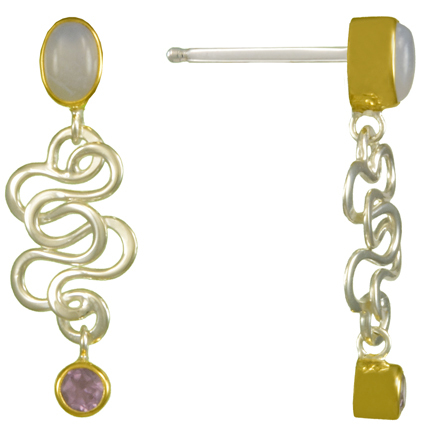 This pendant features Michou’s Pearlescent Satin Finish and 22kt Gold Vermeil granulation giving it a rich, soft feel. The pearlescent finish was created to resemble mother of pearl. Michou’s Infinity Collection is a free-form, flowing celebration of the circle, the most important of all the magic symbols, the sign of eternal spirit and feminine life forces. An ancient symbol of unity, the circle’s wholeness and completion is the perfect icon of the Infinite. Infinity is circles of the sun in gold vermeil, circles of the moon in silver, dimensional circles full and round, circles awaiting pools of light, and circles open to the possiblities of the Universe. And then, spun into Michou’s pearlescent matte silver, or against a backdrop of polished shine, Infinity’s jewels dance dark into light. Infinity is the essence of cool sophistication against the backdrop of a complicated world. At the same time, its timeless meaning in teh realms of Magic cannot be denied when this most powerful of symbols rests against the skin. Wear Infinity as a reminder when dancing alone by candelight in forest dark, and fell not only yourself again, but somehow all those who have faced shadow and found a spark of the Eternal.